I have enough leftover turkey to last into the new year. Every year the organic local turkey I order gets bigger and bigger. I swear, I will need to ask for the runt of the litter next year. But it was well cooked, great dressing, great gravy. I will be freezing a lot of turkey. Eric made the best brussel sprouts with chestnuts. THAT was so good. Sometimes, just for fun, daughter Liz participates in the local chestnut harvest. Chestnuts are becoming more and more interesting to me as a flavor. Eric's folks were here too. They are the finest people. (Yeah, Sally, I know you might read this, but you guys are the best.) It shows in Eric, if I had never even met you.. Kids played. Our favorite game was thought up three? years ago by grandson Owen, now age 7. It is called "Raise your Hand If you.." then finish the phrase. And raise you hand. We even played it on Skype with Ben and Beth and family in Boston. Sometimes it gets hilarious. Virginia and Noah host our dinner. They have a big ole house with a wall of stringed instruments. 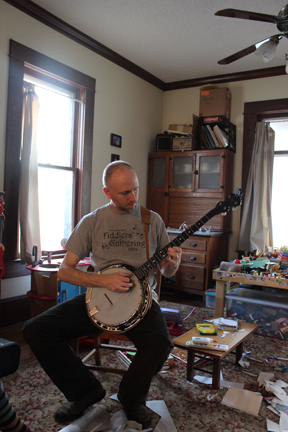 Every musician in the family has their favorite instrument, but they play at least two. After dinner, when the dishes are being done, they play. When dessert and coffee is served, they play. 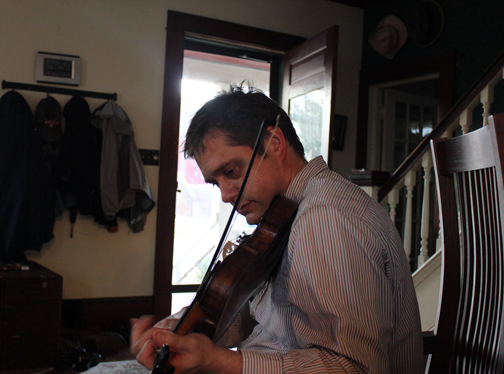 I can't tell you the joy of home-made music after a homemade dinner in a big ole Kansas house. I am very grateful for Noah and Virginia who host this every year, when I could no longer do the whole thing without the community of family. 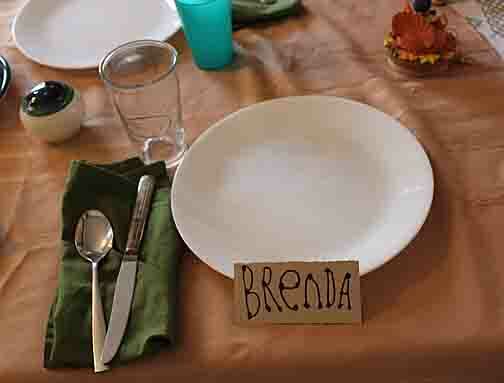 Owen and Kellar made the place cards and set the table. Yes, I was missing a fork, but it was remedied. And later, some music. I am grateful for Noah and his banjo..it makes so much happen around him. Here he is in the chaos of a kid played living room. 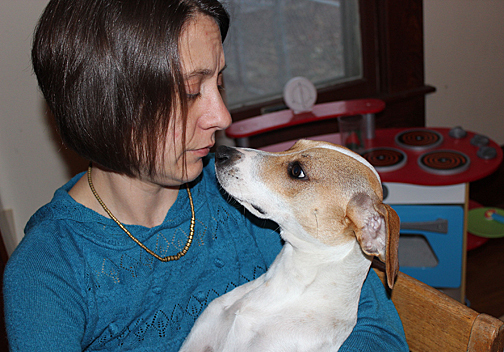 Virginia, not playing an instrument here, except for the recently adopted from the Shelter, Georgia.I think they are discussing something. There are so many more photos I could have posted. This is just the gist of the thing. And two things...I am a lucky ducky.This is true. And just as I say on every Thanksgiving evening.."I shall never eat again"..This is apparently, a lie.